Book DJ Darla Bea for your wedding and watch your guests dance the night away! No wedding is too big or too small for Darla (from 35 guests to a party of 220). Plus your personal music taste will always be reflected in her eclectic collection of tunes! At venues as large as the 500 person capacity Resort Ballroom at the Bacara or as small as an intimate backyard settings at Private Montecito Estate for 60 guests. 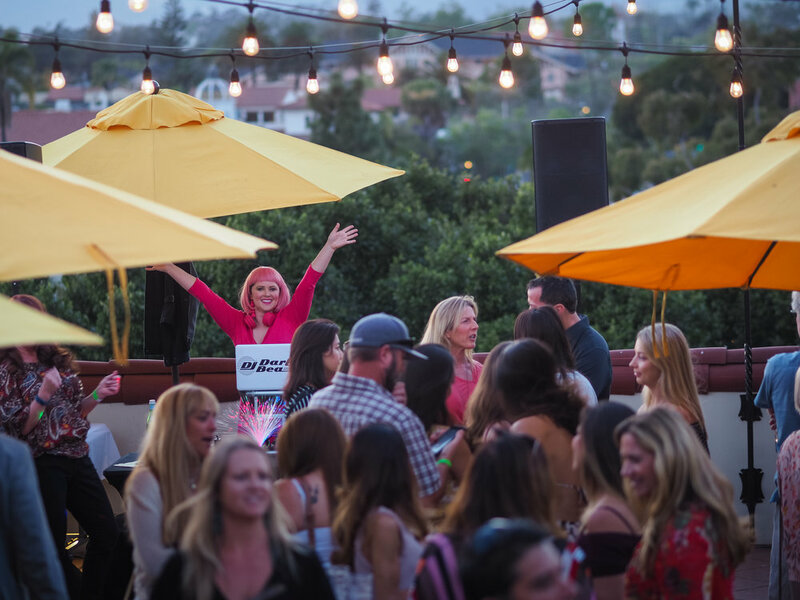 Booking Darla for your wedding reception will ensure that you will have an Emcee to direct your wedding guests on what will be happening next during your cocktail hour, dinner & dancing as well as having the best event DJ in the 805 get your guests moving & grooving during your special day! *Includes ceremony sound system (wireless microphones for vows, lapel mic for officiant), cocktail hour/dinner sound system with microphones for toasts/announcements and sound system for dance portion of wedding with subwoofer speakers for booming bass to keep party rocking. Book Darla Bea for your birthday, anniversary, graduation or any other themed celebration! Pick a theme and Darla will break out her best costume and lead the crowd in celebrating the occasion. Your event is sure to ROCK with DJ Darla Bea on the decks! Revel in her eclectic song selections to fit every guests style and genre request + dance the night away! Darla brings a booming sound system perfect for cocktail hour through dancing, wireless microphones for corporate speeches and presentations, disco ball colored lighting and costume (if specified) to go with any party theme!